You start with a simple question: How can I make sourdough bread? Your first attempts are straightforward failures. You think, this is tricky, but I’ll figure it out soon. You don’t, of course. Sourdough contains multitudes. Your question is simple in the same sense that “could we land on the moon?” or “what’s the worst that could happen?” are simple. So you keep at it. 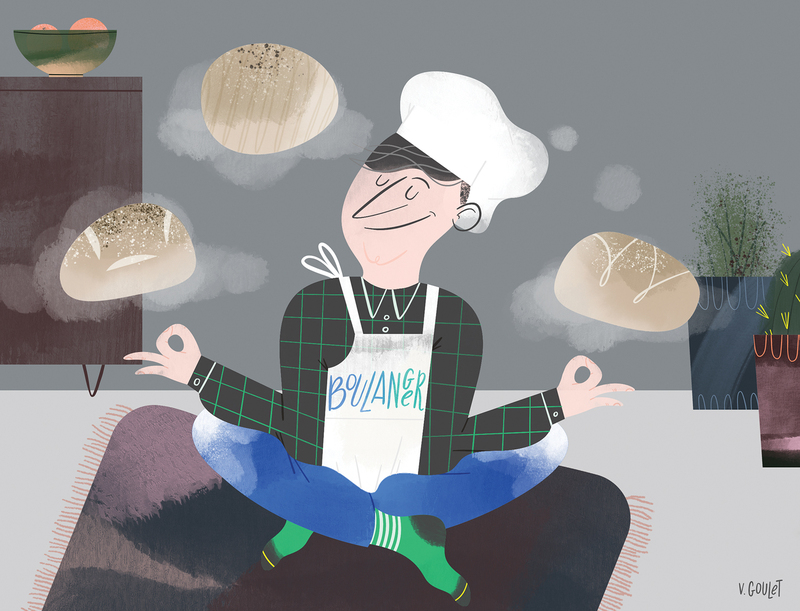 With practice and research, you bread gets better, more predictable. Every improvement brings new flaws. Each bake’s imperfections add detail to the perfect loaf you see when you close your eyes. Your interest, like your sourdough starter, never stops growing. It has a life of its own. You’re just along for the ride. You spend an alarming amount of time and money in pursuit of your imagined perfect loaf. Soon your kitchen is cluttered with cast-iron baking pans, plastic fermentation tubs, infrared thermometers, wicker bannetons and esoteric crust-scoring razors. Every pair of jeans you own acquires a patina of flour. Your computer’s hard drive fills up with spreadsheets tracking the time, temperature and flour mix of each new attempt at perfection. Your most recent bake is good. Delicious, even. But it’s not quite there. You’ll get it next time, you say. Maybe the time after that. You tell yourself you can stop whenever you want. Sometimes, when the bread comes out of the oven looking like a deflated football or when your alarm goes off at 4 a.m. so you can mix the dough before work, you tell yourself that you should stop. You can just buy bread, after all. You meet people in the course of your quest, fellow travellers on the Pilgrimage of Dough, like the grumbling chemist who lives near Whyte Avenue and the office worker exploring sourdough for its purported medical benefits. Or the baker who works at the downtown farmers’ market. When he realizes you share his obsession, he starts selling you locally milled flour at cost. This he hauls over to your condo in 20-kilo bags. You meet him in the parking lot outside, his station wagon still running. You pay cash and wonder if this is what it’s like to buy drugs. Eventually you work up the nerve to give him one of your loaves during a delivery. Later he tells you he thinks it’s pretty good. His daughter liked it too, he says. Other people also like it — the friends and family who have worried and wondered about your weird, growing obsession with bread. Sometimes they ask you to bring a loaf when you come over for dinner. Sometimes they complain when, unasked, you don’t bring one. Sometimes you feel nervous when attending social events without bread. Will people still like you if you don’t have a fresh loaf? Later, you leave Edmonton. You find your sourdough reminds you of home somehow—imperfect but moving, slowly, towards perfection. You start to give your new neighbours loaves and starter in the hope that it will make this new place feel more like the old one. Sometimes you still have to tell yourself again that you can stop whenever you want. But you find you don’t want to yet. Lewis Kelly is a gluten enthusiast and writer. He recently moved from Alberta to British Columbia, where he runs a boutique writing shop called Mercury Communications.